Over the last 2+ years Delta has been renovating and expanding JFK Airport’s Terminal 4. The expansion has a budget of $1.2 billion and will replace Terminal 3 for Delta’s international flights out of the airport. The Sky Club will have 24,000 square feet of space and include the first ever Delta Sky Deck, a 2,000 square foot outdoor terrace. The Sky Deck will offer guests amazing views of Manhattan which I’d definitely love to get a chance to see. The Sky Deck sounds like a great addition for an airport lounge. Delta’s new Terminal 4 sounds pretty amazing, but what I am most excited for is the great food options that will be available once you get through security. Shake Shack is the opening that I am most looking forward to. I can’t wait to hear what the airport- inspired concrete flavors will be for the T4 locations. I’ve written about my love for Shake Shack a few times- attending the Grand Opening of the Brooklyn location and checking out Shacktoberfest. 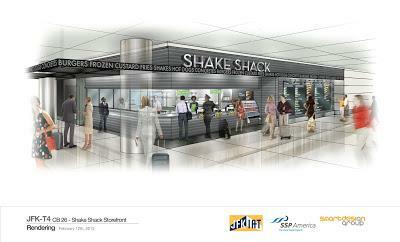 There will actually be two Shacks at Terminal 4 but it’s not their first time opening in an airport. They opened earlier in the year at Dubai International Airport (DXB). I reached out to Shake Shack and asked them a few questions about the upcoming openings at Terminal 4.They told me how they are excited to be a part of the new Delta terminal, but didn’t have anything else to share at this time. I also asked if Shake Shack had plans to expand to more airports and was told that there are no current plans for other airport Shacks. Marcus Samuelsson- theTop Chef Masters champion and James Beard award winning chef will open Uptown Brasserie and Street Food by Marcus Samuelsson. Blue Smoke on the Road- An airport version of Danny Meyer’s NYC barbecue restaurant Blue Smoke. La Brea Bakery- The popular artisanal bread maker will have a location at T4 serving sandwiches, salads, fresh breads and pastries. What are you most excited to see at Delta’s new Terminal 4? – Michael W.
← How many AMAZING deals are still going strong! Will you miss out? As a New Yorker I love hearing this! (even though I fly primarily out of LGA). Delta has done an amazing job reinvesting in NYC. Cant wait to check out the new Sky Deck! Any news on when we should expect construction to be completed?